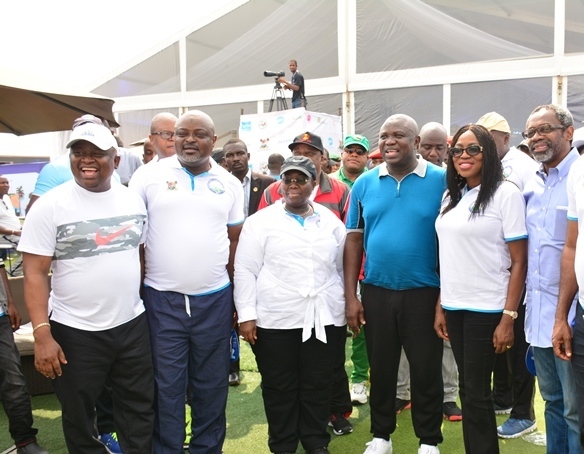 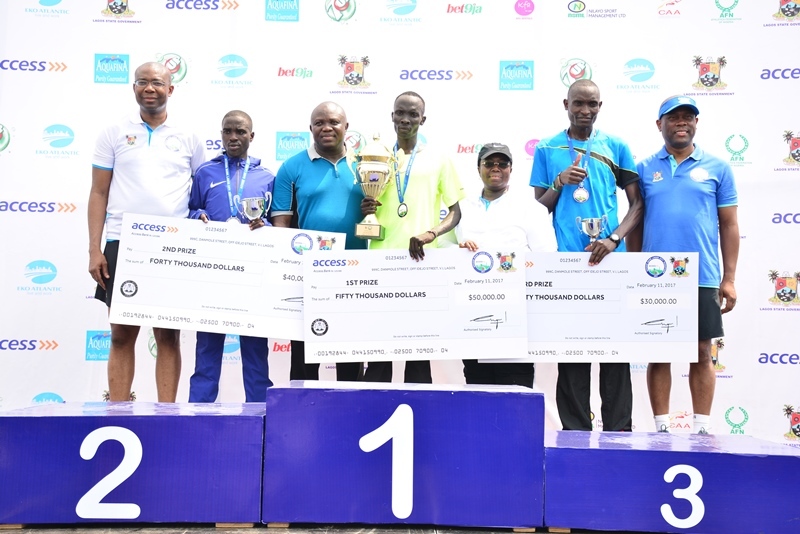 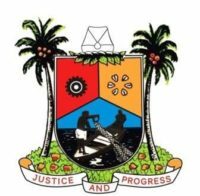 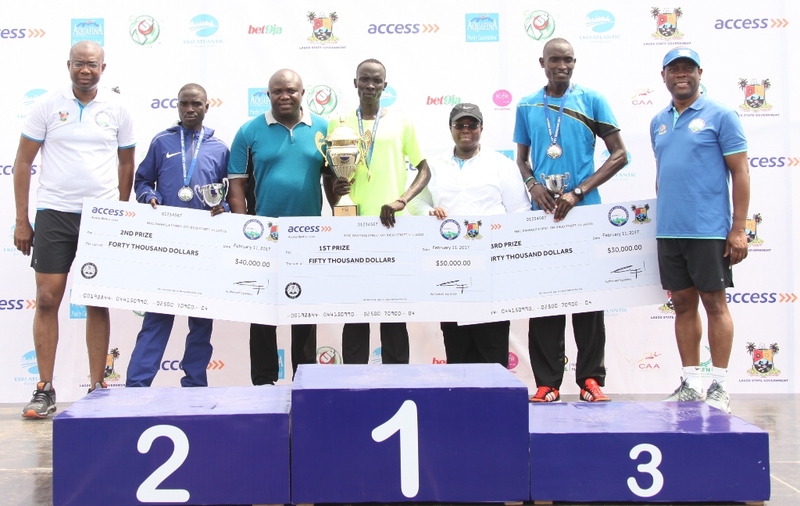 Lagos State Governor, Mr. Akinwunmi Ambode (3rd left), with President, Nigeria Stock Exchange, Mr. Aigboje Aig-Imoukhuede; 2nd Prize Winner of the 2017 Lagos City Marathon, Ronny Kipkoech Kiboss from Kenya; 1st Prize Winner, Abraham Kiptum from Kenya; Deputy Governor, Dr. (Mrs) Oluranti Adebule; 3rd Prize Winner, Kiprotich Kiroi from Kenya and Group Managing Director, Access Bank, Mr. Herbert Wigwe during the 2017 Lagos City Marathon at the Eko Atlantic City, on Saturday, February 11, 2017. 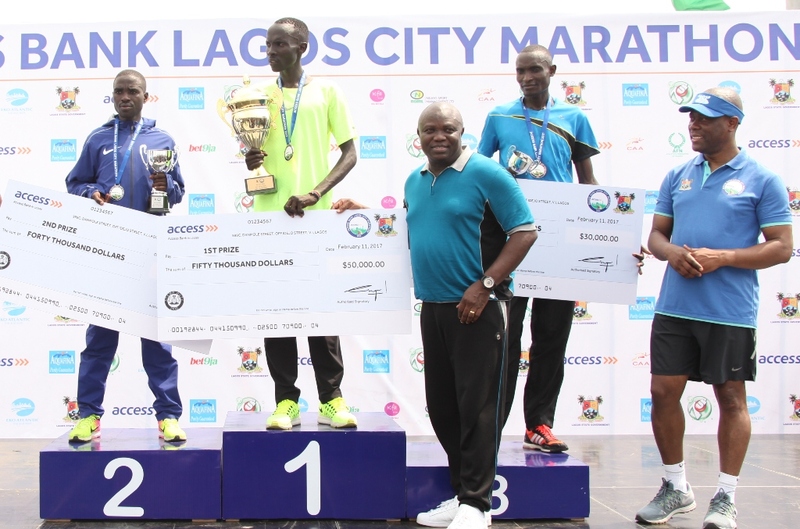 Lagos State Governor, Mr. Akinwunmi Ambode (middle), presenting a medal to the Winner of the 2017 Lagos City Marathon, Abraham Kiptum from Kenya (3rd right) while 3rd Prize Winner, Kiprotich Kiroi from Kenya (2nd right); Group Managing Director, Access Bank, Mr. Herbert Wigwe (right); 2nd Prize Winner, Ronny Kipkoech Kiboss from Kenya (3rd left); President, Nigeria Stock Exchange, Mr. Aigboje Aig-Imoukhuede (2nd left) and Deputy Governor, Dr. (Mrs) Oluranti Adebule (left) watch with admiration during the 2017 Lagos City Marathon at the Eko Atlantic City, on Saturday, February 11, 2017. 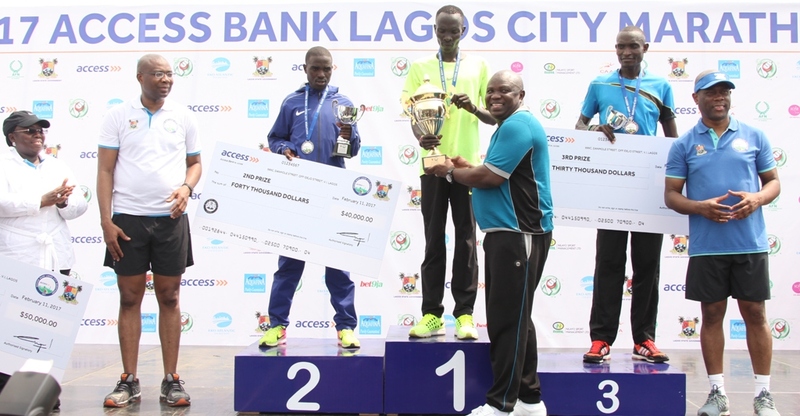 Lagos State Governor, Mr. Akinwunmi Ambode (middle), presenting a cheque of $50, 000 to the Winner of the 2017 Lagos City Marathon, Abraham Kiptum from Kenya (2nd left) while the 2nd Prize Winner, Ronny Kipkoech Kiboss from Kenya (left); 3rd Prize Winner, Kiprotich Kiroi from Kenya (2nd right) and Group Managing Director, Access Bank, Mr. Herbert Wigwe (right); watch with admiration during the 2017 Lagos City Marathon at the Eko Atlantic City, on Saturday, February 11, 2017.